Liverpool's Sadio Mane missed the decisive spot kick as Cameroon beat Senegal 5-4 on penalties to reach the Africa Cup of Nations semi-finals. Mane, Africa's most expensive player, was denied by Fabrice Ondoa, Vincent Aboubakar hitting the winning penalty. Much fancied Senegal had a great chance to win it in normal time but Moussa Sow volleyed wide from close range to leave the game scoreless after 120 minutes. Cameroon are four-time winners of the tournament. The result means Mane is likely to make a swift return to his club Liverpool, who suffered a surprising 2-1 home defeat by Wolverhampton Wanderers in the FA Cup fourth round on Saturday. There were striking similarities to this game and 15 years ago, when Cameroon and Senegal met in the 2002 final in Mali. 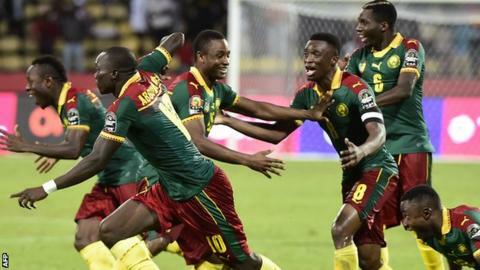 On that occasion, Cameroon beat Senegal 3-2 on penalties after a goalless 120 minutes. Senegal were made to pay for missing a number of chances in both normal time and extra time. West Ham's Cheikhou Kouyate headed an early chance over the bar while Stoke City's Mame Biram Diouf was close with a lob from inside the area. Cameroon, who will now face the Democratic Republic of Congo or Ghana on Thursday for a place in the final, failed to register a noteworthy shot in the opening hour. Their first serious attempt on target came in the 65th minute when Robert Ndip Tambe volleyed straight at Abdoulaye Diallo before the Senegal keeper produced a low one-handed save to keep out Benjamin Moukandjo. Diallo was responsible for ensuring the tie went to penalties after a fine stop to keep out Jacques Zoua in extra time. In the shootout, there was nothing to choose between the two teams as the first eight penalties went to plan. At 4-4, Mane stepped forward but Ondoa saved his kick. That presented Aboubakar with a chance to seal victory and the Besiktas forward made no mistake. Match ends, Senegal 0(4), Cameroon 0(5). Penalty Shootout ends, Senegal 0(4), Cameroon 0(5). Goal! Senegal 0(4), Cameroon 0(5). Vincent Aboubakar (Cameroon) converts the penalty with a right footed shot to the top left corner. Penalty saved! Sadio Mané (Senegal) fails to capitalise on this great opportunity, right footed shot saved in the centre of the goal. Goal! Senegal 0(4), Cameroon 0(4). Jacques Zoua (Cameroon) converts the penalty with a right footed shot to the centre of the goal. Goal! Senegal 0(4), Cameroon 0(3). Henri Saivet (Senegal) converts the penalty with a right footed shot to the bottom right corner. Goal! Senegal 0(3), Cameroon 0(3). Adolphe Teikeu (Cameroon) converts the penalty with a right footed shot to the high centre of the goal. Goal! Senegal 0(3), Cameroon 0(2). Moussa Sow (Senegal) converts the penalty with a right footed shot to the bottom right corner. Goal! Senegal 0(2), Cameroon 0(2). Ambroise Oyongo (Cameroon) converts the penalty with a left footed shot to the bottom right corner. Goal! Senegal 0(2), Cameroon 0(1). Kara (Senegal) converts the penalty with a right footed shot to the bottom left corner. Goal! Senegal 0(1), Cameroon 0(1). Benjamin Moukandjo (Cameroon) converts the penalty with a right footed shot to the bottom left corner. Goal! Senegal 0(1), Cameroon 0. Kalidou Koulibaly (Senegal) converts the penalty with a right footed shot to the bottom left corner. Penalty Shootout begins Senegal 0, Cameroon 0. Second Half Extra Time ends, Senegal 0, Cameroon 0. Attempt missed. Moussa Sow (Senegal) left footed shot from the left side of the six yard box is close, but misses to the left. Assisted by Sadio Mané. Kara (Senegal) wins a free kick in the defensive half. Foul by Vincent Aboubakar (Cameroon). Foul by Saliou Ciss (Senegal). Jacques Zoua (Cameroon) wins a free kick in the attacking half. Attempt missed. Papa Alioune Ndiaye (Senegal) right footed shot from outside the box misses to the left. Papa Alioune Ndiaye (Senegal) wins a free kick in the attacking half. Foul by Jacques Zoua (Cameroon). Attempt blocked. Vincent Aboubakar (Cameroon) right footed shot from the centre of the box is blocked. Keita (Senegal) wins a free kick in the defensive half. Foul by Michael Ngadeu-Ngadjui (Cameroon). Foul by Papa Alioune Ndiaye (Senegal). Jacques Zoua (Cameroon) wins a free kick on the left wing. Adolphe Teikeu (Cameroon) wins a free kick in the defensive half. Keita (Senegal) wins a free kick in the attacking half. Foul by Georges Mandjeck (Cameroon). Sadio Mané (Senegal) wins a free kick in the defensive half. Foul by Sébastien Siani (Cameroon). Delay in match Saliou Ciss (Senegal) because of an injury. Christian Bassogog (Cameroon) wins a free kick on the right wing. Attempt missed. Keita (Senegal) left footed shot from the centre of the box is too high. Assisted by Saliou Ciss. Attempt missed. Papa Alioune Ndiaye (Senegal) right footed shot from outside the box is high and wide to the right. Substitution, Senegal. Papa Alioune Ndiaye replaces Cheikhou Kouyaté.